A few weeks ago, my friends at the Food52 shop (formerly known as Provisions) asked if I’d be interested in creating a recipe with one of their featured items this season–the Staub Round Dark Red Cocotte–and sharing it with my readers. I’m always happy to help get the word out about special items on the Food52 site, but I was especially excited about this opportunity, as I’ve never worked with a Dutch oven before. I had a fantastic time creating the hearty, wintery soup you see pictured above, and picking up some handy facts about Dutch oven cooking along the way. Dutch ovens are thick walled pots, usually made of cast iron but sometimes made of ceramic or clay as well. They’re beloved because of their tremendous versatility: a Dutch oven can be used for sauteeing, frying, roasting, baking, simmering, or boiling. Some Dutch ovens are even used over open flame. 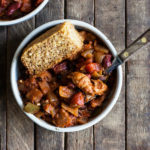 When I was thinking about what to create for this post, I really wanted to make a soup or a stew (it’s been freezing here in New York, so soup is often on my mind), but I felt as if I “should” create a recipe that involved transferring the pot from the stovetop to the oven, to show off its versatility. I was being silly, of course. The beauty of a Dutch oven is that you can use it for pretty much whatever you like: soups, stews, casseroles, and other one-pot meals. You can keep your Dutch oven handy, and no matter what’s for dinner, you can rest assured that it will be a reliable vehicle. Dutch ovens feature tightly fitting lids, which means that they’re well suited to longer cooking or simmering times. 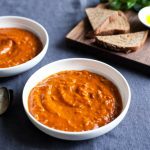 As you’ll see, this soup recipe is a little more involved than my typical throw-everything-into-a-pot-simmer-and-blend method for pureed soups, but the hearty, comforting mixture that resulted was so worth it. There are all sorts of varieties of Dutch ovens out there, but I can’t imagine one that’s sturdier or prettier than the Staub cocotte (“cocotte,” by the way, is the French word for a Dutch oven). It features an enamel that’s chip resistant and incredibly strong, and it also resists discoloration, even over the course of time. …which is a good thing, because the color of this cookware is so, so beautiful. Pretty enough that you could bake a warm, wintery dinner and then bring it straight to the table for family, friends, or guests. 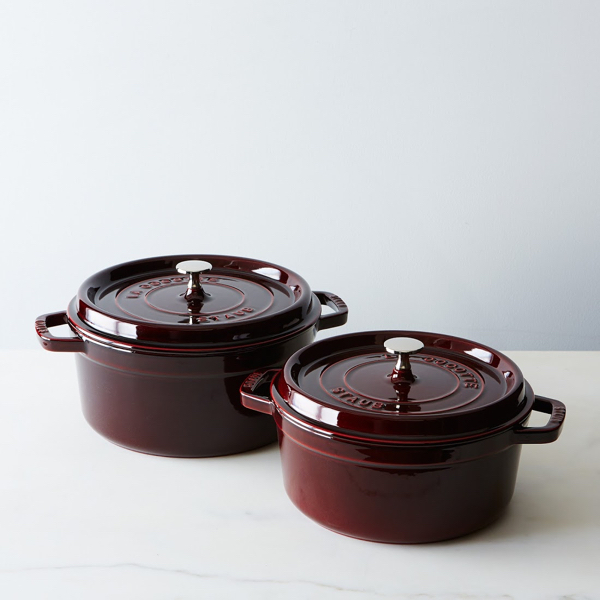 The cocotte comes in two sizes, a four quart and a five and a half quart. 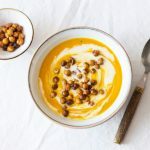 The four is definitely roomy enough for me and my recipes, but both pieces would come in handy in any kitchen–I find batch cooking and freezing is particularly welcome at this time of year. And now, let’s talk about the soup itself. This dish is the best kind of comfort food: filling, full of texture, flavorful, and warm. I’ve been wanting to make some sort of pasta e fagioli (Italian for “pasta and beans”) dish for a while now; I make pasta with lentils pretty often, but not beans. I could have just prepared a pasta dish, but I loved the idea of something long-simmering and fragrant. When I was trying to figure out how to use the Dutch oven, I did a little googling. I found this awesome round up on Buzzfeed, and the recipe that caught my eye first was this one-pot meal from the folks at The Kitchn. I modified it to omit the bacon and streamline the cooking process somewhat, and I used navy beans in place of cannellini. The results were as rewarding as the Kitchn editors suggested it would be, and Steven and I savored the leftovers for days. Place the navy beans in a bowl and cover them with 3 cups water. Allow them to sit overnight, or for 8 hours. Drain them, rinse them, and set them aside. Heat the olive oil over medium heat in a large, heavy bottomed pot or a Dutch oven. Add the onions and sprinkle them with salt. Saute the onions for 7-8 minutes or until they're very soft and clear. Add the celery and continue cooking until the celery is soft, about 3 minutes. Add the garlic and cook for one more minute. Add the navy beans and the bay leaf, along with enough water to cover the beans by 1 inch. Cover the pot and reduce the heat to a simmer. Simmer until the beans are tender but not mushy (this should take 45-75 minutes). Check the beans starting at the 45 minute mark, and if they're not ready, check them every ten minutes until they're tender. Remove the bay leaf. Add the pasta, tomatoes, thyme, salt, and pepper to the soup. Add 1½ cups additional water, or more/less as needed (depending on how soupy or stew-like you want the pasta to be; it will thicken considerably as the pasta cooks). Cook, stirring every couple of minutes, until the pasta is cooked al dente (about 8 minutes). Stir in the baby spinach and cover the soup for a few moments to allow the spinach to wilt. 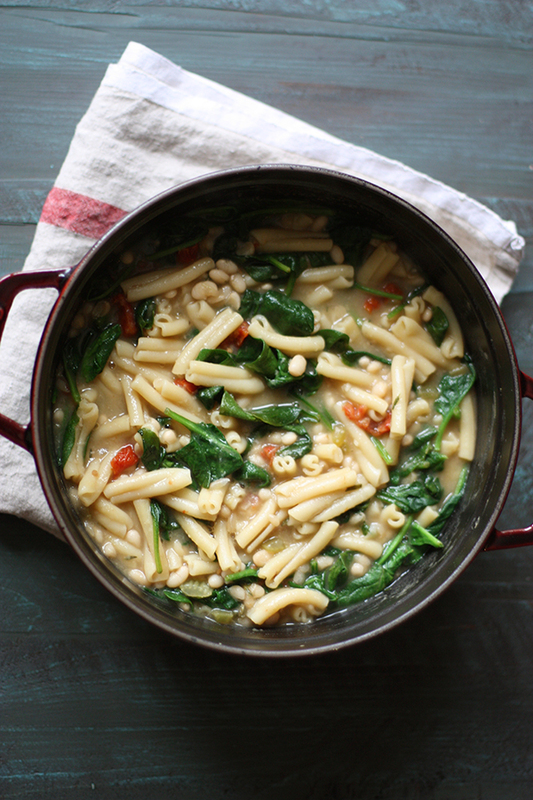 Keep stirring until the spinach is tender and cooked into the soup. Taste soup to adjust seasoning and add water as needed. If you like, stir in herbs or basil. 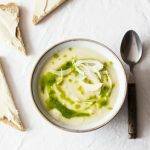 Serve soup with a small drizzle of olive oil if desired, or with crackers or a hunk of crusty bread. Soup will keep in the fridge, covered, for up to five days, and can be frozen for up to a month. The leftovers of this soup may be even more appealing than the dish itself. Sure, the pasta gets a little mushy, but in some ways that’s a good thing. By the way, this is the sort of recipe that holds up well to adaptions. If you don’t have spinach (or you don’t care for it), try using kale or chard or collards. If you’d like to add zucchini or fresh tomatoes or a drizzle of pesto in the summer, by all means, do (because that sounds awesome). Experiment with different pasta shapes, like orzo. Have fun. Soups are such a great canvas for creativity. 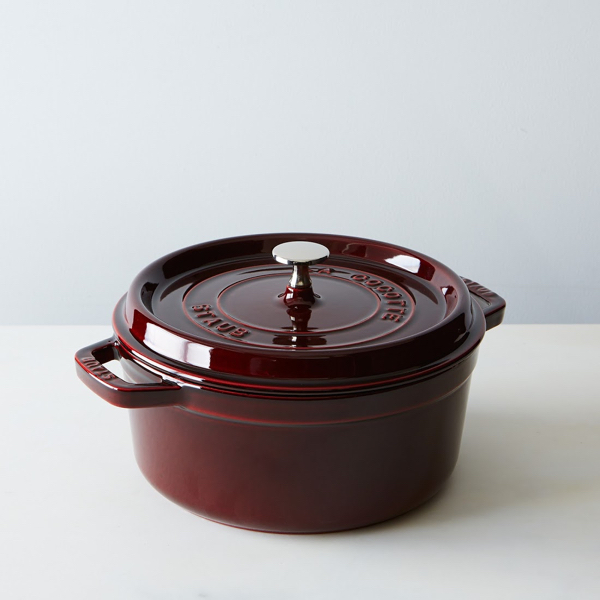 The Staub dark red cocotte is on sale now on the Food52 site. It’s a sturdy, beautiful, and worthy kitchen item, and I’m looking forward to creating many more meals with it! And if you’re looking to get a Dutch oven at a slightly more affordable price, then you can scour eBay, Craiglist, or even local yard sales for a used model. The beauty of these ovens is that the cast iron gives them long, productive lives. Enjoy the soup, friends, and good night! 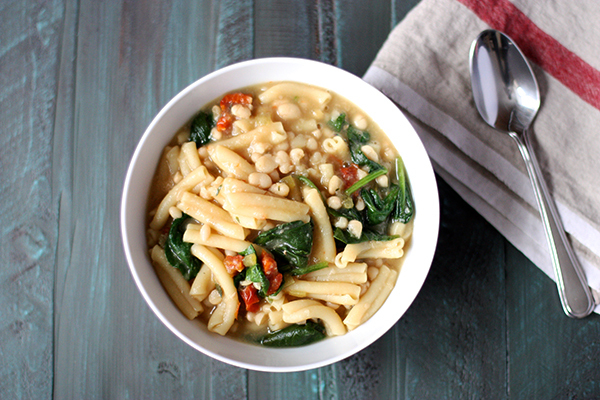 Pasta e fagioli soup was one of the first things i learned to make as a kid! And I just love it. Thanks for sharing a very nostalgic recipe–I’ll se sure to try it out and see if it’s as comforting as I remember! That soup looks so warming and yummy. And that Staub dark red cocotte is so gorgeous! This soup has warm memories for me. I am definitely trying this on my snow day today! I love it! This soup looks delightful and so comforting. Wow, this recipe looks fab! I always used to make a pasta e fagioli recipe from Nigella Lawson which was (incidentally) vegan. 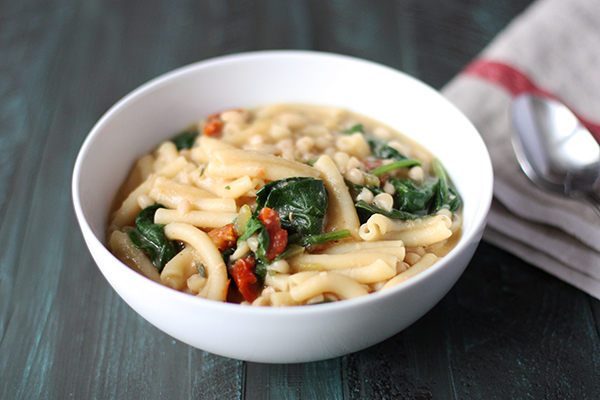 It’s perfect comfort food for a rainy winter’s day. Really keen to try your version now! The soup looks delicious. I have 3.5 and 5.5 quart Le Creuset dutch ovens that I use for EVERYTHING. No better cookware than enameled cast iron, in my opinion. I have a 6qt red le crueset that is aboit five years old and as awesome as the day i bought it! 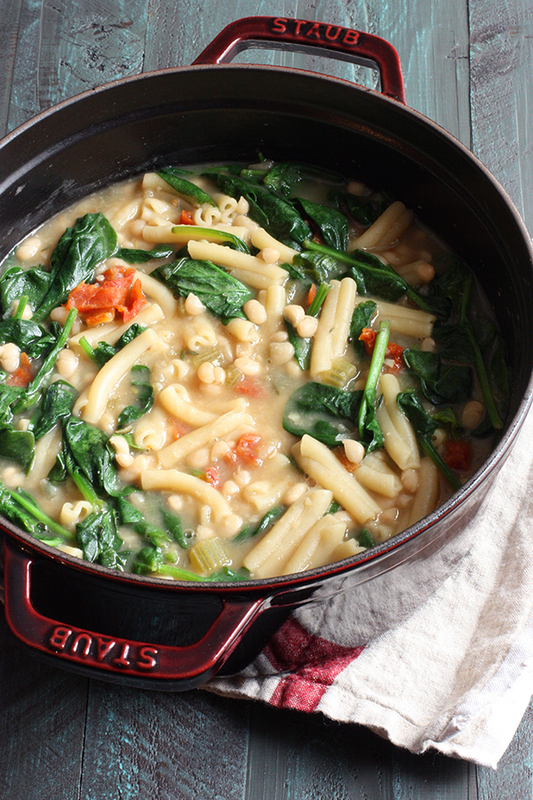 This soup does look perfect for the icy weather. I’ve had a Staub cocotte for years and it’s unkillable as far as I can tell. Prefer it by far to the Le Creuset one I had had before. I use it like a slow cooker in the oven. Put everything in, put it in a 200/250 oven for the afternoon, done. This soup looks great too! Will have to try it this weekend. Mmm I love pasta! I don’t tend to get a lot of protein in it though, so I love the addition of beans in this soup. Love the dutch oven! This soup looks so comforting, nourishing and warming – so perfect for the cool weather now. I have to make it! Made this soup tonight. It’s light and satisfying and goes together easily. My husband asked me to make it again— he thought it was good, and it is! We topped ours with fresh basil! Nice recipe to pass on to a friend!